Adrian Feint was an illustrator, designer, printmaker and painter whose reputation was first established through his graphic work. He was a skilled book and magazine illustrator, creating covers for 'Art in Australia' and the 'Home' among other publications, and produced a significant oeuvre of bookplates, for which he became internationally known, with a well-received exhibition of them held at the Library of Congress, Washington in 1930. 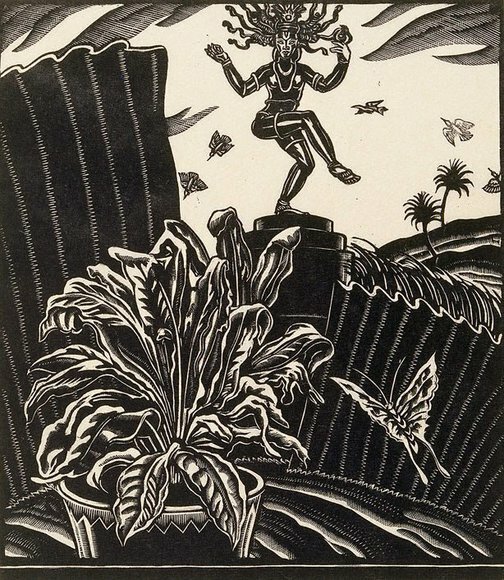 Feint made etchings in the early 1920s but later became more interested in woodcuts and wood engravings, the first of which he exhibited in 1927 while a student of design with Thea Proctor. Feint made two versions of 'The goddess and the aspidistra', in which decorative domestic objects have been arranged in an elegant and witty montage; the Gallery has the key and colour woodblocks for another version that is slightly larger in size, with subtle differences in imagery, such as the cloud forms in the sky. The print echoes the self-consciously tasteful imagery of Proctor's eclectic still life compositions, although it was made several years after they quarrelled, and may be a pointed comment on her work, rather than an affectionate homage. Signed l.r., pencil "Adrian Feint". Not dated. Deborah Edwards, Sydney moderns: art for a new world , 'Frank Weitzel: tableau of the modern city', pg. 164-169, Sydney, 2013, 168 (illus. ), 317, 324.